A game, fast weight-carrier that ran best over a mile, and had a career that spanned seven years, Sultan was later the leading sire in Great Britain for six successive seasons. 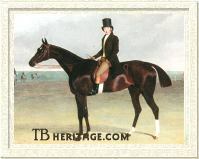 Through his son, the dual classic winner Bay Middleton, he was the conduit through which the Byerley Turk sire line passed into the present, and through his son Glencoe, he established a long-lasting sire line in the U.S.A., and two potent maternal families via Glencoe's daughters Pocahontas and Reel. His sire, Selim, was one of three famous brothers -- the others were Castrel and Rubens -- and a sister, Oaks winner Bronze, by Buzzard, out of a mare by Alexander. Selim was purchased as a three year old by the Prince of Wales, and for him won six races, including Newmarket's Oatlands Stakes twice, Newmarket's Craven Stakes, and some matches. When the Prince's stud was disbanded, Selim was given to Colonel Leigh. He stood at various locations, including Sir Hedworth Williamson's Oxcroft Farm, in and around Newmarket for most of his stud career, and got six classic winners, among them Derby winner Azor (1814), Medora (1811) and Turquoise (1825), both Oaks winners, Two Thousand Guineas winners Nicolo (1820) and Turcoman (1824), and an unnamed filly that won the One Thousand Guineas. He was leading sire in Great Britain in 1814, and got several sire sons who continued the tail-male line for some generations. Selim's son Langar, got St. Leger winner Elis, Mr. Wags (a leading sire in France), and Epirus, a leading sire in Great Britain and the sire of Derby winner Pyrrhus The First and Two Thousand Guineas winner Pitsford. Sultan, however, was, by far, his most influential sire son. Sultan's dam was Bacchante (1809, by (Williamson's) Ditto), that had been bred by William Henry Vane, 3rd Earl of Darlington and later Duke of Cleveland, owner of the famous Raby Castle on the border of Durham and Yorkshire counties. Ditto (1800), a brother to the influential sire Walton (both by Sir Peter Teazle), and half-brother to Derby winner Pan (by St. George), was bred and raced by Sir Hedworth Williamson, who had business interests and an estate, Whitburn Hall, in County Durham and owned Oxcroft Farm, near Newmarket, where Selim stood at stud for some years. Bacchante, owned as a broodmare by William Crockford, bred three live foals: Sultan (1816), his sister Sultana (1820), and an unnamed filly by Selim (1823), that died without produce. Bacchante died in 1824, while in foal again to Selim. 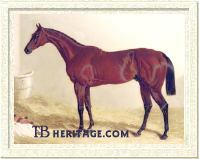 Sultana was later dam of Corset (1829, by Whalebone), a winner of a handicap sweepstakes over Newmarket's Two Year Old course, of Turk (1828, by Phantom), who ran second to Camarine in a race at Newmarket for juveniles, and other runners, but her tail-female line did not last beyond a few generations. Bacchante's offspring by Selim were line-bred to the greats of the English turf -- 4 x 4 to Herod, 4 x 4 to Eclipse, and 4 x 4 to Herod's best son, Highflyer. Crockford would establish England's most famous "hell" in 1827-28, a high-end London gaming club, Crockford's, designed specifically for the wealthiest of London's sporting society, with an opulent neoclassical design that cost almost £100,000 in construction and furnishings, and featuring haute-cuisine by an imported French chef. From this he amassed a great fortune, but even before he created this masterpiece of relieving the rich of their wealth, he had been a successful operator and bookmaker at Newmarket Heath, and by 1807 was running Watier's, an earlier London club founded by the Prince of Wales that featured high-stakes gambling. Crockford was also a racehorse owner, and Sultan, referred to in gaming circles as "Crocky's white nose," ran in his colors for five years. Sultan was described as having a "lovely head, long back ribs, and muscular quarters." He was long in the back, a trait he passed on to some of his offspring, notably Glencoe and Wisdom. He was a rich, red bay, with three socks, and a coronet on his near hind leg, and a distinctive blaze that extended to encompass his nostrils. A contributor to the Old Sporting Magazine reminisced in 1831 that he saw Sultan "...run all his races; but if defeated, I never saw him run a jaded shuffling, spirit-broken horse. He had his favourite courses [the Two Year Old course at Newmarket, and, to a lesser extent, The Flat], in which, though carrying very heavy weights, he never had his equal." As a juvenile, Sultan ran once, placing third in the July Stakes at Newmarket to the fillies Miracle and Caroline, and beating twelve other youngsters. At age three he won two matches at Newmarket Craven, beating Lord Jersey's Juniper for 200 guineas, and Lord Foley's filly Miracle for 200 guineas. In the Derby he was a creditable second to Soothsayer's best son, Tiresias, beating thirteen other horses. Schooling for the Doncaster St. Leger he injured himself "...and was with difficulty got into Mr. Maw's stables at Belle vue, adjoining the course. The consternation that ensued bars all words [many wagers had been laid in his favor], and cuts description short." That was it for Sultan until the next season, and probably accounted for the select care taken in running him in successive years. In 1820, age four, he was engaged in a big 1,000 guineas match at Newmarket against Rubens, which he won. Next up was the Oatlands handicap at Newmarket, where he ran third to Banker and the more lightly weighted Barmecide (by Selim), beating two others. In the fall he beat a two-year-old, Rasselas, in a 200 guineas match at Newmarket, and then ran twice more unplaced. The next season, 1821, carrying 8 st. 9 lbs., he won the Gold Cup over 1 mile-2 furlongs at Newmarket Craven, beating four other horses. Then at Newmarket First Spring he won a second Gold Cup over the Ditch mile, carrying 9 st. 12 lbs., beating Robin Hood (8 st. 2 lbs.) and eight other horses, and a 5 - 1/2 furlong sweepstakes, carrying 10 stone, beating five horses. In October at Newmarket he won the Trial Stakes, beating Robin Hood again, and five other horses. He did not place in his last race of the season, and was then sold to Thomas Foley, 3rd Baron, whose seat was Witley Court in Worcestershire, which he paid the noted architect John Nash to classicize in 1805. Foley's Selim filly had won the One Thousand Guineas in 1815; he also owned Paris (by Sir Peter Teazle and from Arethusa, and so brother to Ditto, Sultan's dam's sire), winner of the 1806 Derby, and Interpreter, winner of the Two Thousand Guineas in 1818. The next season, 1822, in Foley's colors, Sultan beat Gustavus, the previous year's Derby winner, in a 200 guineas match over the Rowley Mile at Newmarket, and received a 100 guineas forfeit from the Selim mare, Selma, at Newmarket October. In 1823 at Newmarket Craven he received a 250 guineas forfeit from the good horse Master Henry, and at the same meeting beat Godolphin (by Partisan) in a 500 guineas match, even weights. At Newmarket First Spring he received forfeits from Master Henry, and at Newmarket Second Spring, received another forfeit from Master Henry; at the latter meeting Foley challenged for The Whip, which Sultan received unchallenged. After the Whip challenge Foley sold Sultan to Brownlow Cecil, 2nd Marquess of Exeter. For Exeter Sultan won the Trial Stakes at Newmarket in 1824, beating Premium (by Aladdin), a horse half his age, and two others. He ran three more times that season, but was unplaced, and after a long, if not too heavily stressed career, he finally entered the stud. Sultan was retired to Burghley, the grand property near Stamford in Lincolnshire that had been established as the Cecil family seat in the third quarter of the sixteenth century by William Cecil, Lord Treasurer to Queen Elizabeth I. Successive generations of the Earls of Exeters enriched the holdings, with works of art -- the greatest collection of 17th century Italian art beyond Italy-- and a spectacular landscaped park and gardens by one of the greatest masters of landscape architecture, Capability Brown. Sultan was another gem in the riches at Burghley, providing the Marquess with three classic winners and other good runners. In all Sultan was the sire of five winners of the Two Thousand Guineas, including Derby winner Bay Middleton, and two winners of the One Thousand Guineas, including Oaks winner Galata. The success of his offspring, winning a total of 496 races, made him the leading sire in Great Britian for six successive years, 1832 through 1837. All his offspring, according to The Druid, "were fleshy and good doers." Exeter's horses were trained by Charles Marson, who in ten years with Exeter had won or received forfeits in 207 races. It was through Sultan, a tail-male descendant of (King) Herod, that the Byerley Turk sire line survives into the present. His grandson, the outstanding runner The Flying Dutchman (1846, by Bay Middleton), took the line to France, where through his son Dollar (1860), it thrived. Sultan's son, Glencoe, took this tail-male line to America, where, beginning with Virgil in 1864, a succession of American classic winning stallions were at the forefront of racing through the turn of the twentieth century. Glencoe also got two extremely influential broodmare daughters, Pocahontas (1837) in England, and Reel (1838) in the U.S.
Sultan's first classic winner was GREEN MANTLE (1826), bred and raced by Exeter. She was out of Dulcinea (1816, Family 6 - b), by Cervantes, who had produced July Stakes winner Redgauntlet (1822) to the cover of Scud in 1822. Green Mantle was a successful racehorse that could go two miles and had outstanding speed. She won the Oaks Stakes of 1829 and was second in the One Thousand Guineas. Her other wins included the July Stakes, like her half-brother; the Clearwell Stakes, in which she frittered at the post and lost forty yards which she made up easily with her speed; the Prendergast Stakes; a 750 guineas sweepstakes at Ascot; the Port Stakes, and the Swinley Stakes. She was matched against the great distance mare Lucetta in a match for 200 sovereigns over the Newmarket Ditch-In in 1830, but lost. She was also third to Lucetta and to The Colonel in the 1830 Ascot Gold Cup. Green Mantle produced the good runner Troilus, who ran second to Mango in the Newmarket St. Leger, and she bred on, with representatives from her family winning stakes races in England and France through the 1930s, including Beauminet (1877, by Flageolet), winner of the Prix du Jockey Club, Prix Royal-Oak, and other important races. Green Mantle's sisters by Sultan, CARDINAL CAPE (1832), and MACREMMA (1836) also bred on: the great grey Chilean runner and stallion, Filbustero (1937) was a descendant of Macremma in tail-female. 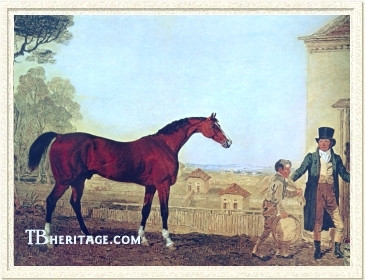 AUGUSTUS (1827), out of Exeter's good race mare Augusta (winner of the 1821 Oaks, "one of the best and soundest mares that ever dared making her own running of the Oaks.") by Woful, won twelve races for Exeter, including the Two Thousand Guineas, the Newmarket Stakes, the Newmarket St. Leger, the Grand Duke Michael Stakes, and the Swinley Stakes. He also won a handicap at Newmarket in which 14 horses ran the entire race before a false start was declared -- he had placed second to Fortitude -- and on the rerun, with seven horses withdrawn, he took first place. His placings included a second in the Column Stakes to Priam, and in 1831 he ran in a match for 500 sovereigns against that good horse, but was beaten by a length. Like other Sultan offspring, he was difficult to rate and often fought his jockey. Sold at age five to a Mr. Sowerby, he was second to Mazeppa in the Newport Pagnell Cup. In the 1830 Derby he had a rabbit, Red Rover, provided by Exeter, but he did not place. As a stallion he got Rosa Bianca, second to Crucifix in the 1840 One Thousand Guineas. His brother AURELIUS (1832) won some races and was then sold to the East India Company. 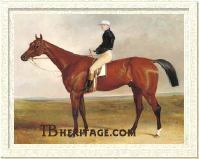 Another brother, ADRIAN (1834), was second to Harkaway in the Goodwood Cup of 1838. Galata GALATA (1829) was, in the opinion of turf writer The Druid, "the best of the Burleigh Mares." She was so high strung that her trainer Marson was obliged to school her by herself "otherwise she would not touch an oat," and she would "utterly beat herself" if rated. She was light in flesh, had big feet, and was on the leg. Her dam was the fast race mare Advance (Family 3 - b), by Pioneer, who also produced Exeter's MAHMOUD (1827) to the cover of Sultan. Galata won eight of her eleven starts. Galata took a walk-over at Newmarket Craven at the beginning of her three year old season. Her next start was the One Thousand Guineas, which she won easily, beating three other fillies. At Epsom she beat a far better field of twenty fillies, many of which had been good juvenile winners or would go on to important wins, by two lengths. "Observator" in the Sporting Magazine of 1832 noted: "I never saw such a thoroughly vanquished lot in my life!...The winner is as racing-like an animal as ever imprinted foot on Epsom Downs, and her action is an example for all time." She went on to win the Windsor Forest Stakes at Ascot easily, never headed. Then she went up against the colts in the Grand Duke Michael Stakes, and was beaten into third by Margrave and Salute (the latter a filly she had beaten in the Oaks). At Newmarket Second October she handily beat Salute in a sweepstakes. The next season she won the Port Stakes over two miles at Newmarket Craven, again, putting away the field -- which included Clearwell Stakes winner Emiliana, Two Thousand Guineas winner Archibald, and other good horses, and then beat the good mare Lucetta in the Ascot Gold Cup, taking such a terrific lead at the start that Lucetta's jockey let her canter in ten lengths behind. She also received a forfeit in a race at Newmarket in the fall. In 1834, age five, she failed to place in the Oatlands and the Ascot Gold Cup, her only starts, and was retired. She bred live eight foals before dying in 1848: her daughter Cosachia (1844, by Hetman Platoff), bred two colts by West Australian, Clermont (1862) and Czar (1863), both winners of the Zukunfts-Rennen at Baden-Baden (Germany). GALATA'S brother MAHMOUD was a good winner for Exeter. As a juvenile he won the Prendergast Stakes at Newmarket, and the Albany Stakes at Ascot. At age three he was second to Erymus in Goodwood's Drawing Room Stakes, second to Priam in Newmarket's Riddlesworth Stakes, and third in Priam's Derby. Glencoe The next classic winner by Sultan was the Earl of Jersey's GLENCOE (1831), out of the classic-placed Trampoline, by Tramp. Trampoline was out of the great broodmare Web, a foundation mare in Jersey's Middleton Stoney stud at Oxfordshire. 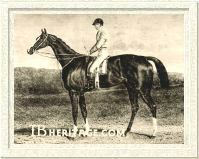 Glencoe's sister, GLENCAIRNE (1838, Family 1 - t), became the ancestress of many successful winners, including Cherimoya (1908, Epsom Oaks), Brie (1875, French Oaks), Bernborough (1939), Alycidon (1945), and Easy Goer (1986). GLENCOE won the Riddlesworth Stakes, the Dessert Stakes, the Two Thousand Guineas, Ascot's Royal Stakes (walk-over), The Goodwood Cup, the Racing Stakes, the Garden Stakes, the Ascot Gold Cup, and The Whip. In all, winning eight of his ten starts, with one second and one third (Derby) placing. GLENCOE spent one year at stud in England, where he got the great mare Pocahontas (1837), and Ascot Stakes winner Darkness, after which he was purchased by American James Jackson and sent to Alabama. After seven years there, he stood in Tennessee for a few years, and then Kentucky. He was leading sire eight times in the 1840s and '50s in the U.S., getting a number of good runners, including some that were shipped back to England to win races, and Vandal (1850), who established a successful branch of the Sultan sire line in the U.S. His American daughters had a significant impact on bloodstock breeding, among them Novice, the dam of Norfolk, by Lexington and Reel (1838), a great race mare and the dam of Lecomte, Prioress, and War Dance. View a chart of horses descending from Web in Lord Jersey's stud, including 4 Two Thousand Guineas winners by Sultan: Glencoe, Ibrahim, Bay Middleton, Achmet. Of Web's immediate descendants, Jersey's trainer Edwards said "They're fat as pigs: if I work them two days together, they're lame; and if their bellies brush the ground, they're so good they'll get through." IBRAHIM (1832) was the second of four successive Two Thousand Guineas winners by Sultan bred by Lord Jersey. He was out of an unnamed mare by Phantom that was sister to Cobweb, a grandaughter of Jersey's foundation mare Web. His wins included the Riddlesworth Stakes at Newmarket, the Two Thousand Guineas, the Grand Duke Michael Stakes, and £550 at Ascot. His sister, ODESSA (1833) was, through her daughter Flax, the second dam of the great racemare Queen Bertha. His half-sister, Princess, by Slane, won the Oaks. His brother, ISHMAEL (1830), became a well-known sire of jumpers; Ishmael got the small talented gelding Abd El Kader, twice winner of the Grand National Steeplechase at Aintree, and his grandson Auger got a great many dark chestnut heavy hunters. DESTINY (1833) was out of the Filho da Puta mare Fanny Davies, who had won the Doncaster Foal Stakes and the Pontefract Gold Cup for her breeder, Thomas Houldsworth. Houldsworth lived at Farnsfield, Nottinghamshire, where Filo da Puta stood at stud. Destiny won the One Thousand Guineas for Houldsworth, and in the Oaks, facing twelve good fillies, she ran second by half a length to Cyprian. 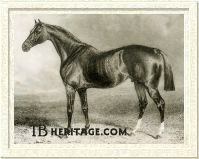 BAY MIDDLETON (1833) was another classic winning Sultan colt bred by the Earl of Jersey. He was out of Cobweb, a grandaughter of Web. Like his near-relative, GALATA, he was a nervous, and also obstreperous, colt in training, but with time he settled down, and was unbeaten as a racehorse. He got Sultan's good hind-end, and had a "wicked style of head, and arched neck," similar to his sire's. He won Newmarket's Riddlesworth Stakes under the name of "Brother to Nell Gwynne," and took a walk-over for £150 at the same meeting. At Newmarket's First Spring meeting, he became Sultan's fourth winner of the Two Thousand Guineas, and Jersey's (and Sultan's) third winner in succession of that race. Next came the Derby, in a field that included such horses as Gladiator, Venison, and Slane, which he won by two lengths in a late dash. He then won the Buckhurst Stakes at Ascot, the Grand Duke Michael Stakes at Newmarket First October, and finally, a 300 guineas match against Muezzin at Newmarket Houghton. Bay Middleton BAY MIDDLETON was purchased by Lord George Bentinck for a huge sum, and stood at stud in Doncaster; when Bentinck died, he was bought by E.L. Mostyn, and died in his care in November of 1857. As a stallion he was considered a disappointment, taking into account his own high quality and the quality of the mares he serviced. Still, he was leading sire twice -- 1844 and 1849 -- and he got four classic winners, including The Flying Dutchman, a wonderful racehorse later sent to stud in France, where he got Dollar, one of the most influential stallions ever in France. Dollar's branch of the Sultan tail-male sire line is still successful today, through Ahornoora (1975) and Indian Ridge, and has included such familiar names as Tourbillon (1928), Djebel (1937), Hethersett (1959), My Babu (1945), and the great jumpers descending from Cantab (1957). His daughters are seen in the far reaches of the pedigrees many good runners today. Sultan's last classic winner was Bay Middleton's brother, ACHMET (1834), the fourth Two Thousand Guineas winner bred by Jersey, and another unbeaten son of Sultan and Cobweb. His big wins were the Riddlesworth Stakes and the Two Thousand Guineas. A third brother, CAESAR (1836) also won the Riddlesworth Stakes, beating Euclid, and was second in the Two Thousand Guineas, but did not place in Bloomsbury's Derby. He broke down at age four in a sweepstakes at Newmarket Craven. Sultan got numerous other winners. Of his sons, HAEMUS (1828), raced and bred by Exeter from the Waxy mare, Bess, won Newmarket's Albany Stakes and the Royal Stakes at Ascot. His sister, VARNA (1826), ran through 1832 for Exeter, and was second to the classic winner Lucetta in a sweepstakes at Newmarket in 1831; she became second dam of Tronquette (1844, by Royal Oak), winner of the Poule d'Essai des Poulains in France. Wisdom BEIRAM (1829), another high strung, fast, front-running Sultan colt bred by Exeter, was out of Miss Cantley (1812), by Stamford. As a juvenile he won a handicap sweepstakes at Ascot, the July Stakes at Newmarket, and the Prendergast Stakes at Newmarket Second October, in all races beating very good fields, and he was second in his first race, a sweepstakes at Ascot. At age three he received forfeits in a sweeptstakes at Newmarket Craven, and at Newmarket First Spring won a sweepstakes worth £525, beating two colts and leading start to finish. In his next race, the Newmarket Stakes, that front-running strategy did not work, and he was run down by Mixbury, losing by half a neck. He did not place in St. Giles' Derby where he was washy and drawn even before the start, but won the Drawing Room Stakes at Goodwood, finally and successfully submitting to rating by his jockey. He then ran second to the great Priam in the Goodwood Cup, and at Newmarket in the fall, was third to Archibald in the Newmarket St. Leger, and received a forfeit in a race at Newmarket Second October. The next season he did not place in the Oatlands, ran third in the Claret Stakes and then broke down in the Goodwood Cup, and was retired to Exeter's stud, where he was a moderately successful stallion of tough, game horses. His sister, MECCA (1835) won the July Stakes and Ascot Gold Vase, and in the stud produced Nutcracker (1847), winner of the St. James' Palace Stakes; she bred on (Family 5 - a), with Austrian Derby winner Amaranthus (1876) and the good Brazilian runner Misuri (1929) and Uruguayan winner Mandarin (1918) descending from her. WISDOM (1834), a long colt with a low back, like GLENCOE, was out of the Tramp mare, Victoria, and bred by Devonshire squire Samuel Wreford. At age three he won a race at Stockbridge, divided the forfeits for the Mottisfont Stakes with Venison at the same meeting, and also ran second to Mango by a nose in a sweepstakes there. He also won at Goodwood, and twice at Bath, but was unplaced in the 1837 Derby. HIBISCUS (1834) was third in Phosphorus' Derby. Bred by Exeter, he was from Duchess of York, by Waxy, also the dam of an unnamed MARE BY SULTAN (1829) who produced Cap-a-Pie (1837) by The Colonel. Cap-a-Pie was imported into Australia by Henry Kater of Bungarribee, near Doonside in New South Wales in 1839-40, where he became a very influential stallion, his most noted offspring the great colonial sire, Sir Hercules, that established a sire line there lasting into the twentieth century and that got many successful broodmare daughters. DARDANELLES (1834), bred by the Duke of Grafton and raced by Exeter, was out of Grafton's Pawn Junior (also dam of Two Thousand Guineas winner Dervice, by Merlin), by Waxy; he won the Albany Stakes. ALEMDAR (1835) was out of the Exeter-bred mare Marinella (Family 3 - b), by Soothsayer. He won Ascot's Wokingham Stakes in 1839, was second to St. Leger winner Don Juan in a big sweepstakes at Newmarket, and ran third to Momus and Don John in Newmarket's Port Stakes. Marinella's daughters by Sultan succcessfully continued her tail-female family: one, AYESHA (1831), bred King Edward Stakes winner Envoy (1839), and in Germany bred three winners by Glaucus: Meridian (1845, Henckel-Rennen, Union-Rennen), Achaja (1846, Union-Rennen), and Equator (1848, Henckel-Rennen). The other, ALBANIA (1832), produced Fatima (1842), that in France bred Prix Lupin winner Gouvieux, and two daughters that bred on; Motrico (1925), twice winner of the Prix de l'Arc deTriomphe and other important French distance races, descended from Albania. CLARION (1836), was produced by Thomas Houldsworth's Filho-da-Puta mare, Clara. Raced by Sydney Herbert, he won the 1840 Cesarewitch Stakes handicap, beating Derby winner Bloomsbury, The Corsair, and sixteen other good horses. SCUTARI (1837), one of Exeter's Sultan sons, ran second to A HREF="Emilius.html#Euclid">Euclid in the St. James' Palace Stakes in 1839 and was later a minor sire. KREMLIN (1839), bred by Orde Powlett from Francesca, by Partisan, was raced by the Duke of Cleveland: at age three he won the Doncaster Stakes, the Wolverhampton Gold Cup, beating the great Irish horse Harkaway, and a handicap at Doncaster over the St. Leger course, beating the classic winning filly Industry. CALIPH (1841), bred by Thomas Houldsworth, from his Soothsayer mare Variety, and raced by Captain Pettit, won the County Plate at Oxford, two mile heats; his sister, CIRCASSIAN (1828) was a very good juvenile for Houldsworth, winning a Produce Stakes at York, a Produce Stakes at Doncaster, beating Liverpool, and a sweepstakes worth £800 at York, beating the Saddler; at age three she was third in the Oaks Stakes and the following year second to Camerine (by ten lengths) in Newmarket's Claret Stakes. Of Sultan's daughters not already mentioned, there were some good runners and successful broodmares. Exeter's MARMORA (1828), from Miss Catton by Golumpus, was second to Oxygen in the 1831 Oaks Stakes, and also second to her in a big sweepstakes at Ascot; she bred on, with Irish Derby and Manchester Cup winner Umpire (1873), later a good sire of jumpers, a descendant of hers. FREDERICA (1828), bred by Thomas Houldsworth from the Comus mare Fortuna, won Doncaster's Champagne Stakes as a juvenile for Houldworth, and at age four, running for Mr. Taunton, won the Bridgewater Stakes, beating 1831 St. Leger winner Chorister and other good runners. SWEETBRIAR (1829), from Antiope, by Whalebone, was raced by Lord Uxbridge; in the stud she established a branch of Family 3 - m, which included the great racehorse and stallion Isinglass (1890, by Isonomy). Palmyra The Sultan filly PALMYRA (1838, from the Camel daughter Hester), spent her early broodmare years at Hampton Court, owned by Col. Jonathan Peel, where she was bred repeatedly to his two stallions, Ion and Slane. To the cover of Ion, she produced Tadmor (1846), a stakes winning juvenile of Goodwood's Ham Stakes and other good races that broke down during the 1849 Derby and was later a useful sire; Baalbec (1851), winner of the 1854 St. James' Palace Stakes and other races, and Talfoud (1850), winner of the Newmarket Handicap and the Northampton Cup. To the cover of Slane she bred Sesostris, a good runner, and Zenobia (1848), that bred on for several generations. To the cover of Pyrrhus the First, Palmyra produced Maid of Palmyra, dam of Ebor Handicap winner Verdant (1862 by Marsyas) and his sisters, Viridis (1864) that was the dam of Springfield (1873), and Cybele (1871), dam of Reveller (1883) and second dam of July Cup winner Best Man (1890). Maid of Palmyra was also second dam, through Eltham Lass (1859 by Kingston), of Belmont and Travers Stakes winner Kingfisher (1867 by Lexington), and through Kingfisher's sister, Sabina (1868) ancestress of the grand post-war U.S. filly Bed o' Roses and the speedy and sturdy classic winner and top handicapper Challedon. Sultan's daughter ZULIMA (1831) won the July Stakes as a juvenile and was second in GLENCOE'S Riddlesworth Stakes at Newmarket at age three. EVA (1832), from Eliza Leeds, by Comus, won Goodwood's Lavant Stakes and Newmarket's Hopeful Stakes; she was later the dam of Poule d'Essai des Poulains winner Giges (1837, by Priam). WARESTI (1832), a half-sister to Liverpool (1828, by Tramp), was bred by Mr. Wreford and for him won the 1834 Molecomb Stakes at Goodwood; she bred one foal and then was sold the the Dutch government. An unnamed SULTAN MARE (1834), out of a sister to Cobweb in Lord Jersey's stud, bred Prior of St. Margaret's (1843, by Touchstone), winner of the 1846 Cambridgeshire Stakes handicap. 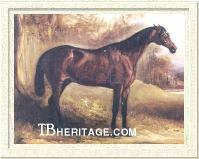 In 1839, after fourteen years at stud, Sultan, aged 23, broke his thigh and was shot. Another, even more famous and successful stallion, Stockwell, was a one-time resident of Burghley stud at the outset of his stud career, but he was sold by Exeter after one season, when the Marquess disposed of his stud to pay for the construction of a railroad line into Essendine. By then, however, Sultan's legacy had already been ensured. SULTAN, Bay Colt, 1816 - Family #8 - b.